Looking for a special gift? Buy a print of this image. 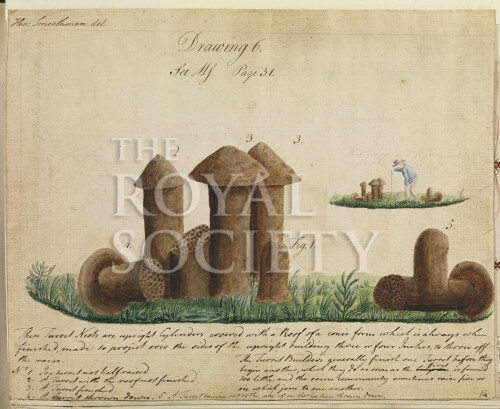 Plate 9 figures 1-6 and one unused figure from the paper “Some account of the termites, which are found in Africa and other hot climates”, Philosophical Transactions of the Royal Society vol.71 part 1 1781 pp.139-192. View of “turret nests” of termites (identified by Smeathman as Termes mordax and Termes atrox) in grassland, with a key to the figures below. An inset figure, showing a European stooping over a smaller scale version of the same scene with a measuring rod, was not used in the printed plate. This figure tentatively identified as a portrait of Henry Smeathman in the essay “Imagining the tropical colony: Henry Smeathman and the termites of Sierra Leone” by Starr Douglas and Felix Driver (2005). A faint pencil inscription above this reads: “This group and figure not to be engraved”. Headed “Drawing 6”. Signed upper left “Hen: Smeathman, del”.